Are you looking for a great book series to read after Harry Potter? 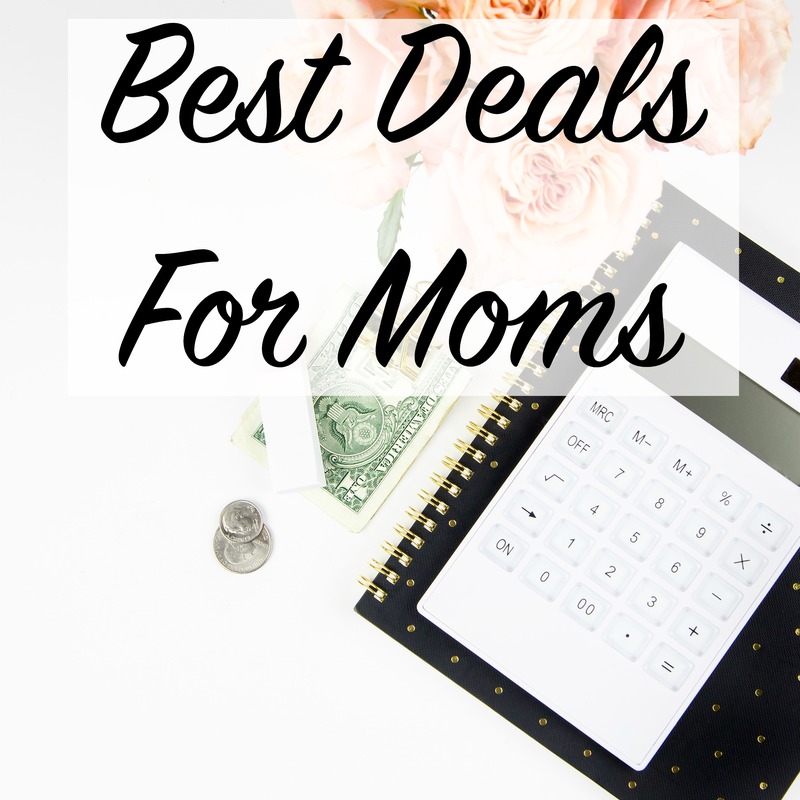 These books are proven page-turners and they are so good that you will probably want to read along with your kids. 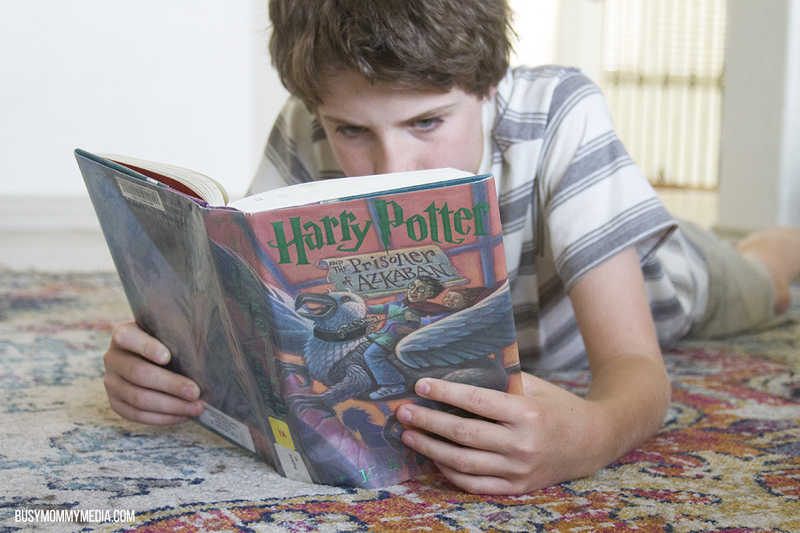 There is no doubt that Harry Potter is one of the best ways to get kids reading. Even reluctant readers latch onto this series and it is fantastic for sparking an interest in reading that lasts long after kids read the last page in the series. My oldest son was a very reluctant reader . . . until he discovered Harry Potter. He read through the entire series, almost without stopping, decided he loved reading, but then had no clue what to read next. He finally decided to just read the full Harry Potter series a second time. For a while there I was worried that this kid would never read anything BUT Harry Potter (although, I suppose there are worse things). Eventually, I convinced him that there were other books out there and he is now an avid reader. All my kids absolutely love reading, thanks in part to Harry Potter and some of these amazing books that we’ve fallen in love with. 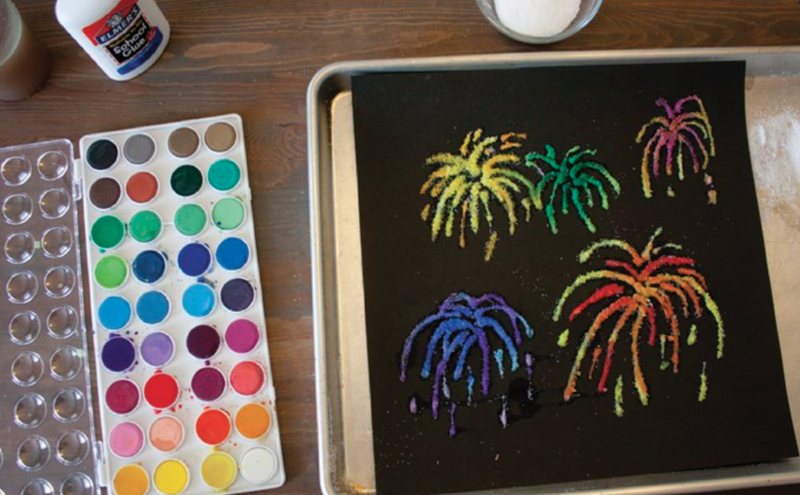 As a lifelong reader myself, I love celebrating some of our favorite books right along with them. 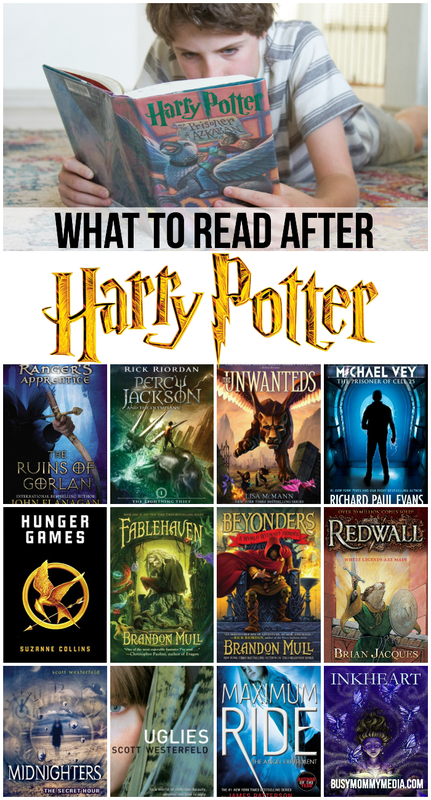 These books are some of our favorites to read after Harry Potter and often what I recommend for parents of teen or tween boys who need some book ideas that really draw them in (for more book recommendations for tween boys, check out this list). 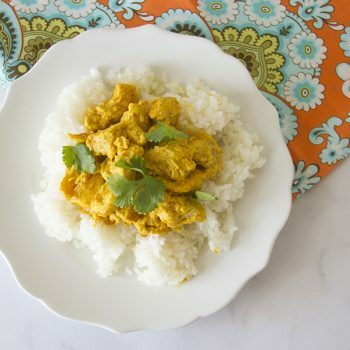 I had to start with this one because it is currently my favorite on this list (although that changes frequently). 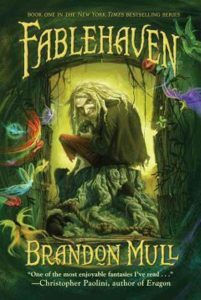 I can’t even tell you how much I loved Fablehaven. It pulled me in from the very beginning and I was so sad when the series ended. This story has everything tweens want: action, adventure, mystery. It took me longer than it should have to get around to reading this series and now I can’t believe that I didn’t read it sooner. I loved it enough that I’ll likely be reading it for a second time down the road. This series tells the story of two siblings who arrive to visit their grandparents, only to discover that nothing is what it appears to be. For Harry Potter fans who love a bit of magic, this is the perfect series. 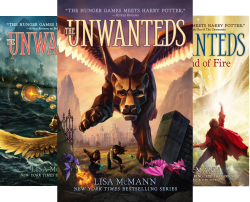 This 5 book series is one that everyone will loved. I read it right alongside my 10 and 12 year old sons and all three of us had trouble putting it down until the very end. Buy the series on Amazon. This series is described as Harry Potter meets Hunger games, so I was expecting big things. I wasn’t completely sold on the first book. The character development didn’t seem to be of the same level as Harry Potter, but the further I got into the series, the more I enjoyed it. A middle grade dystopian fantasy series, these books look at a society who purges anyone who was not necessary or wanted once a year. The Unwanteds were sent off to their death . . . or so everyone else thinks. I’ve been reading this series ahead of my kids and I already know they are going to love it. 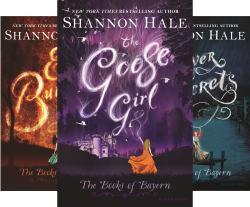 This series has everything from living statues and magic, to family drama. Buy this series on Amazon. Percy Jackson was the first series my oldest son dipped his toes into once he moved onto books that were not Harry Potter. This series was recommended to my son by a friend who loved it (which is way better than a recommendation from mom) and he ended up absolutely loving the series too. He read this series several years ago, and to this day, as a teenager he still loves Greek mythology thanks to this series. This series has been read several times over by my boys and I suspect my girls will all take their turns loving it once they are a bit older. My kids love a good series, which is part of the appeal of Harry Potter, so they were so excited to discover that Ranger’s Apprentice was a 12-book series. My 15 year old really got into this series and my younger kids have it on their list of books to read this summer. 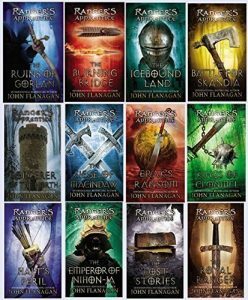 This action-packed series by John Flanagan tells the story of 15 year old Will, who has always been small for his age. when it came time to choose an apprenticeship, he shocked everyone by becoming the Ranger’s Apprentice. Ranger’s were somewhat misunderstood and looked upon with just a bit of fear. My teenager tells me that the series reminds him a bit of Lord of the Rings crossed with Harry Potter. He’s absolutely loved the series and has been telling me for the last few months that I need to read it. It is now next on the list and I’m excited to dive into a series that he has loved so much. The Five Kingdoms is a series that my 10 year old loved so much that I really need to hurry up and finish the whole thing before he gives everything away. 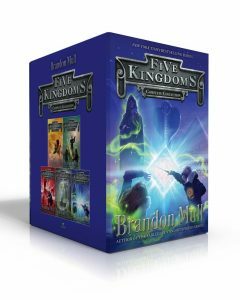 This 5-book series written by Brandon Mull, the author of Fablehaven, draws you in right from the very beginning. 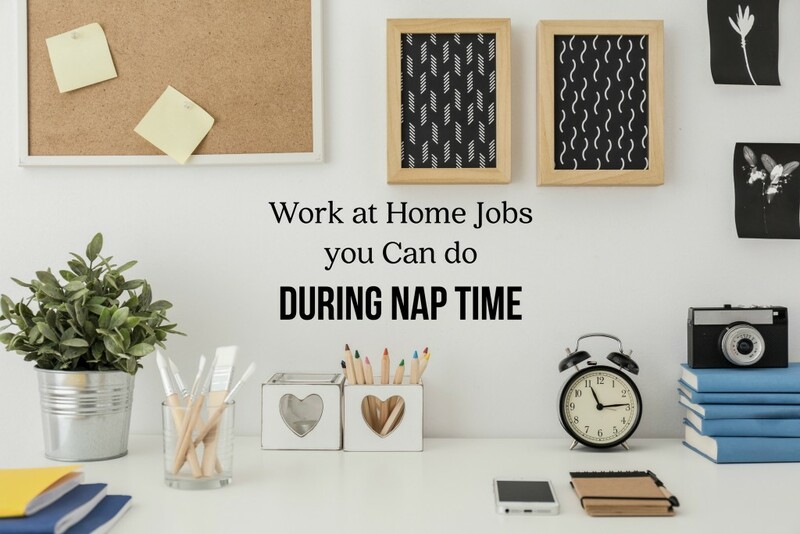 My kids barely came up for air while reading these books and it was a pleasant change to have to drag them away from books instead of video games when they needed to do their chores. Written by New York Times bestselling author James Patterson, this high action adventure tells the story of a group of kids who escaped a lab where they were bred to be 98% human and 2% bird. This is a fast paced series that is perfect for even the most reluctant reader. 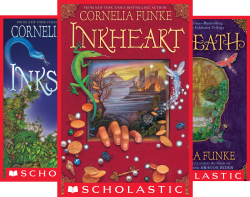 We enjoyed this series several years ago and just discovered that it has been adapted into a TV show, which may or may not be an incentive for more reluctant readers. We enjoyed seeing the story come to live since we had already read the series. There are quite a few spin-off stories to this series too, so the show got my kids excited to jump back in with the characters. This was one that I really enjoyed reading along side my kids. 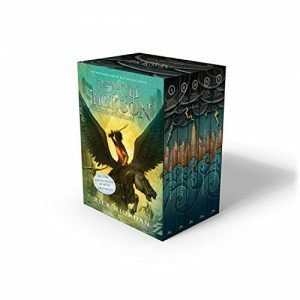 It is suitable for even young teens, and includes plenty of story twists to keep you guessing as a reader. This series was one I’d had recommended to me for years before I introduced my kids to it. I’m not sure what took us so long because they absolutely loved it. 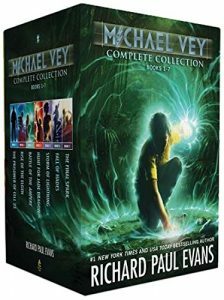 This 7-book series by New York Times Bestseller Richard Paul Evans tells the story of Michael Vey, a 14 year old boy with Tourette’s syndrome. This book follows the pattern that is a favorite with my boys – a kid who discovers he has super powers, in this case electric powers. When Michael discovers that another student at his school has the same powers, they set off to find out why. Their search unveils a group who not only wants to control the electric teens, but the entire world. 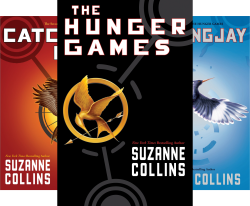 Admittedly, The Hunger Games is not suited for younger teens, but it is a great option for Harry Potter fans. This series pulls you in and doesn’t let you go until the very end. The characters in this series are strong, and stick with you long after the book is over. In the dystopian society of Panem, made up of 12 districts, one girl and one boy must be sent every year to fight to the death in the capital. With an obviously darker theme there is some violence, but that is not the focus on the series. I loved the way the characters overcame and became stronger people than they started as throughout the course of the story. This is a great options for teens who wants something a bit more grown up than Harry Potter. 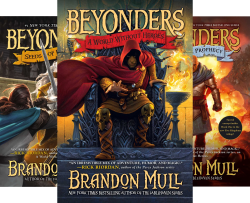 Another great series by Brandon Mull (he’s currently the favorite at my house), Beyonders begins with Jason Walker wishing for a bit more adventure in his life. I’m sure my kids could relate to the storyline! He finds himself transported from the zoo to a mysterious world where he is suddenly a Beyonder. Now he needs to find his way home and gather some allies along the way. 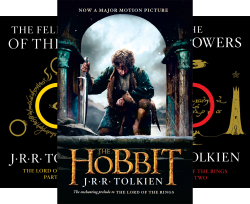 Lord of the Rings is a higher reading level than most teens are used to reading, but if your teen can adapt the the language, the storyline is more elaborate than Harry Potter and one that can withstand multiple readings. I read The Hobbit out loud with my kids when they were in elementary school and they absolutely loved the story. It was a good one to enjoy slowly so they could really take in the language and pick up on all of the intricate plot lines. This is the next series that I’m setting my 15 year old lose on. 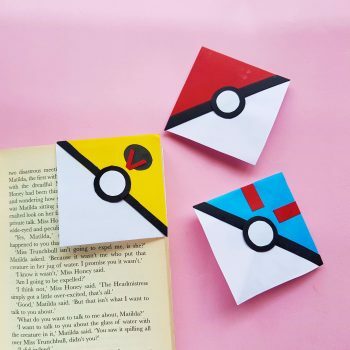 My kids haven’t seen the movies yet, but they are looking forward to them once they are a bit older and have read the books. 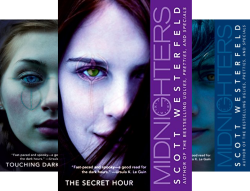 In this series by Scott Westerfield, everyone is believed to be “ugly” until they reach the age of 16 and undergo an operation to turn them into “pretties”. There’s a more sinister reason behind the process though, and Tally, who is nearly 16, needs to decide fast whether she wants to accept everything that comes with being a Pretty. This book is suitable for older teens and is a great one for teens who are dealing with any self-image issues. The whole series is a really quick read and has plenty of fast action. Anidori-Kiladra Talianna Isilee, Crown Princess of Kildenree, has an unusual talent. She discovers while she is young that she can understand the language of birds. As she grows, she is more comfortable talking to animals than people — and for good reason. When she is sent to a foreign land to be married a mutiny on the road sends her running for her life. The princess does the only thing she can, hides in plain sight as the royal goose girl. This adventure keeps you on your toes and the characters are so engaging. 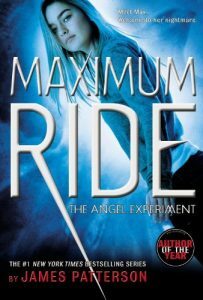 I loved reading the first book in this series and need to get back to finish the rest of the series. This is one I’ll likely read out loud to my 6 year old, as soon as she’ll sit for books without pictures, but it is also one that teens will love as well. 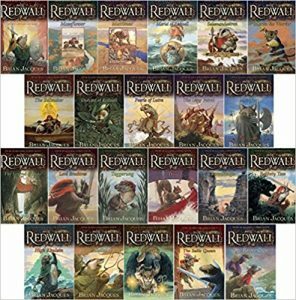 I first read Redwall sometime in junior high. At the time, I thought it was just a single book so I enjoyed it and moved on. I’ve since discovered that this is a 20-book series. I’ve been meaning to go back and start from the beginning. It looks like my 10 year old will probably beat me through the series, though. He tends to have a lot more free time than I do (perks of being a kid). This series is the perfect follow-up to Harry Potter. It’s suitable for younger kids but action-packed enough that even adults will enjoy reading it. This series, by Scott Westerfield (author of the Uglies series mentioned above), is a quick read and perfect for teens. 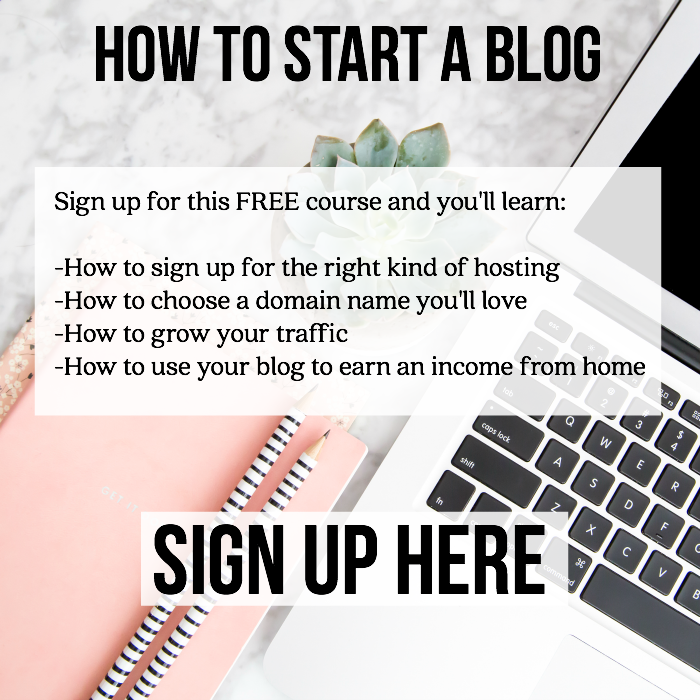 Jessica Day moves to a new town, but it isn’t quite what she expected. 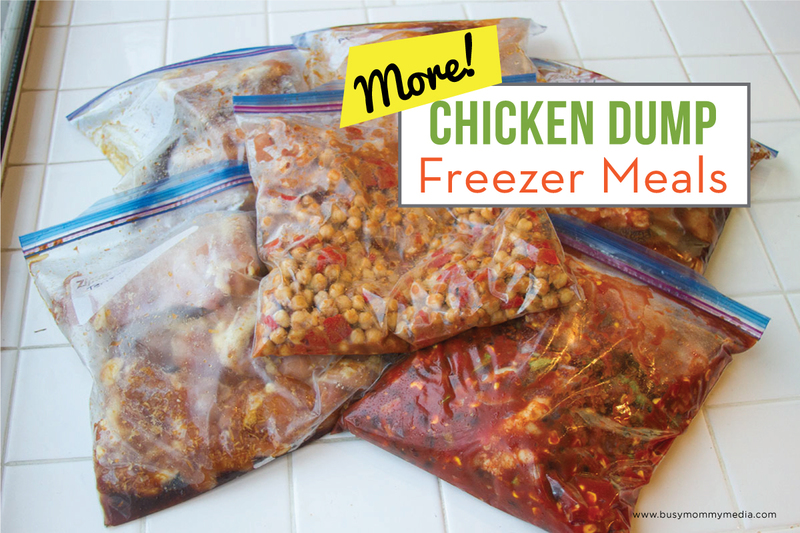 Within her first few days there, she wakes up at midnight to find the world frozen in time. Jessica soon discovers that this secret hour happens every night at midnight. 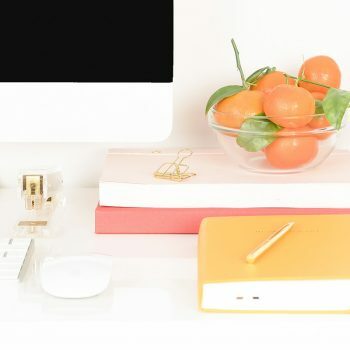 At first, she loves having a private space where she can escape (what teen wouldn’t? ), but she soon discovers that she is not alone. Once I started this series, I read it straight through. Scott Westerfield is a master storyteller and draws you in immediately. If you want to continue the magic of Harry Potter, Inkheart is the perfect way to go. What starts as an innocent story ends in a nightmare. When Meggie’s father reads to her from a book called INKHEART, an evil ruler escapes the boundaries of fiction and joins her in the real world. Meggie gets more than she bargained for with this magical adventure, because she’s the only one who can change the course of this story.